Career ReCharge – the book! This book is a journey to resilience with an itinerary! 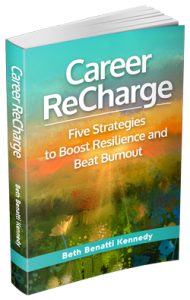 It includes exercises to help readers get the most benefit from each chapter, Resiliency Boosters—actions to take to implement each resilience strategy, and personal success stories from Beth’s coaching clients.Career ReCharge is for anyone ready to enhance their career confidence, engagement, and productivity.